OOFOS, the pioneer of insanely comfortable recovery footwear, announced that its award winning shoes are now available in the UK. OOFOS shoes are designed specifically for runners and fitness enthusiasts to soothe and reinvigorate the feet, allowing a faster recovery time. 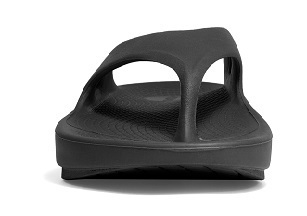 OOFOS shoes combine proprietary cutting-edge Oofoam® technology (37% more shock absorption than other foams) with a patented footbed design that cradles your arches and reduce stress on sore feet, knees and backs, enabling more natural motion. Perfect for runners, triathletes and anyone seriously into their sport and fitness, OOFOS recovery footwear is now available in the UK with two styles for men and women – thong (OOriginal) and slide (OOAHH). Available at oofos.co.uk, from RRP £40. More styles are coming soon. OOriginal for women (thong style) available in black, melon, fuchsia and aqua. Sizes 4-8. £40. OOriginal for men (thong style) available in black and navy. Sizes 8-12. £40. OOAHH Slide available for men and women in black. Sizes 4-8 for women and 8-12 for men. £40. OOAHH Sport available for men only, sizes 8-12. £45. Sports: Multi-sports including running, triathlon, cycling, gym, racquet and stud sports. Recently awarded ‘Gear of the Year 2015’ badge from Runner’s World USA.